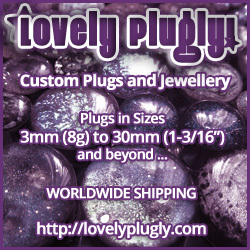 Hello there followers, old and new. You alright? So I decided to go out of my comfort zone this week, going to try new things, like purchasing a pair of black wedgey sandals because I have too many pairs of black boots. Expect a post about broken ankles, and soon! Also going to try and not stamp my nails this week, for a laugh. Right, today's new thing is to do stuff with pastely colours. As it's Pink Wednesday, lets have a look at this here La Femme Pink Cream. 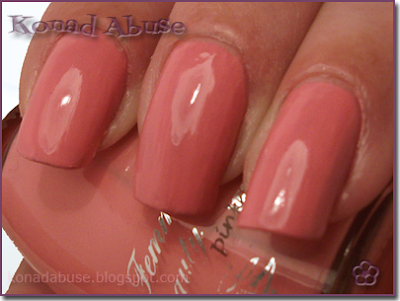 Two coats of La Femme Pink Cream. Had worse. La Femme is a cheap and cheerful brand that isn't too bad really. I've had worse, but I'm old. The colour is like a kick-arse bubblegum pink, it's well-pigmented and TBH I'm not sure it counts as a pastel. It did not like my base-coat at all and had to go on naked nails - even then the application wasn't as pleasant as it could have been, it went a bit patchy and sometimes lumpy. A spot of top-coat smoothed the finish out, though, and it looked alright after that. Actually quite like this colour, yay for trying something new. I wanted another go at the easier marbling (tutorial here), which technically isn't a new thing as I done it t'other day, but I wanted to improve on my n00bskillz. 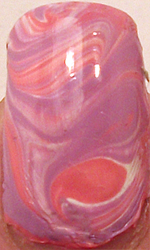 Used La Femme Pink Cream, La Femme Lavender Cream and Barry M Matt White as the marbling polishes. Did pretty much the same thing as last time, quick circle of base-coat, some drops of different colour polish (made the drops wider by teasing them with a marbling tool), did S-shape squiggles and made it look like an abstract mess that I liked. I applied a very thin coat of the base colour to the nail before applying the marbly polish so it stuck to the nail a bit better. Rebel, rebel, your nails are a mess. By the time I'd gotten round to taking photos I'd ruined a few bits and had to do some repairs and a very rushed clean-up job, so the pix look horrible and lumpy. Still wearing it, though. 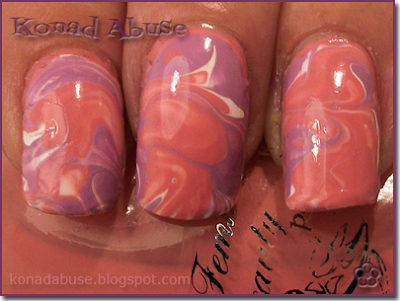 Again I love this easy marbling, so good! Wish i'd known about pink wednesday, next week i'll be participating for sure! This shade of pink is lovely. 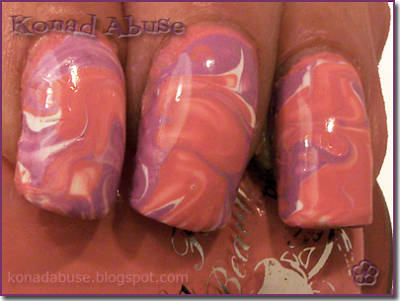 i'm going to try out this style of marbling soon. i'm so glad you came up with it! I am loving your marbling technique,and not to mention it looks excellent!